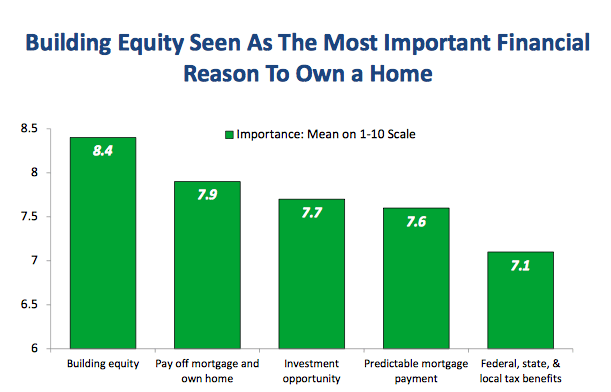 Eighty-four percent of Americans see homeownership as a good investment, but concerns about affordability still loom. Eighty-four percent of Americans believe purchasing a home is a good financial decision, but once again, concerns about affordability in the midst of rising home prices lurk in the background of many would-be buyers’ minds. According to the National Association of Realtors 2017 National Housing Pulse Survey, 60 percent of respondents said affordability and the rising cost of buying or renting a home in their area is a concern. Furthermore, 44 percent categorized the issue as a “very big” or “fairly big” problem. Fifty percent of respondents who are single said the lack of affordability is a big problem; this was a 14 percentage point jump from the 36 percent of married couples who feel the same. Likewise, 53 percent of non-white respondents said lack of affordability is a big problem compared to 40 percent of their white counterparts. This concern about affordability plays out in the financial strain that buyers are willing to endure in order to become homeowners. Millennials (48 percent) and those living on the East (36 percent) and West (33 percent) coasts were the most likely to say their monthly payments are a strain, which is no surprise since those areas are consistently experiencing rises in median rental and for-sale home prices. Despite issues with affordability, buyers and aspiring buyers are determined to become owners even if it means adjusting their budget to fit a higher monthly mortgage payment. Fifty-one percent of respondents said they’d put a strain on their budget to live in a better neighborhood that offers great job opportunities and higher quality schools. Of course, those making over $100,000 (62 percent) were more willing to do so, but a good chunk of those making $60,000 to $100,000 (50 percent) or $60,000 and under (47 percent) were willing to make the sacrifice as well. Why? Well, most respondents see homeownership as a great long-term investment even if it causes financial strain right now. Eighty percent of survey takers said buying a home allows them to build equity, and they said owning your home by the time of retirement is great for building long-term familial wealth and personal net worth. Around 70 percent said owning a home is a good investment opportunity. Just because buyers and aspiring buyers are willing to sacrifice current financial comfort to buy a home, doesn’t mean they have to. As it turns out, buyers are confused about down payment options. Forty percent said a down payment of 15 percent or more was needed to buy a home, but 70 percent said they think it should be lower than 10 percent. In NAR’s 2017 Profile of Home Buyers and Sellers, buyers said they had a down payment of 6 percent, a stat that’s been consistent for the past three years. Brown says the silver lining of the survey comes from respondents’ strong belief in homeownership — something Realtors can capitalize on by properly educating and guiding buyers who are ready to begin their homeownership journey.